For MARY “POLLY” STEVENSON HEWSON 1774 was a bad year. Her two little boys contracted smallpox; they recovered. But her husband of only four years died leaving Polly pregnant with a third child. Doctor William Hewson had constructed a theater in the Craven Street house where he lectured on anatomy to students. At the same time he was carrying on his own research to better understand the human body, particularly its blood and lymphatic systems. Dissecting corpses was one way to increase his knowledge. Hewson died of septicaemia contracted from this hazardous work. He was only 34. In 1998 when conservation work had begun at 36 Craven Street to create the museum that is there today a bone pit was discovered under what had been the garden during Hewson’s two-year residency. Some 1200 pieces of human and animal bones were found from a dozen or so bodies, including some children. 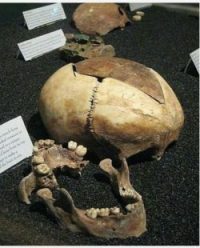 There were saw marks and scalpel scars on many; holes had been drilled in a skull with some sort of trepanning device. Cadavers were difficult to come by; grave robbers delivered some, and there were bodies of unclaimed persons and of those executed. The practice of procuring and selling cadavers was illegal until 1832. Rather than transport the remnants of skeletons and bury them elsewhere, risking discovery, Hewson apparently decided to bury them on site. Benjamin Franklin, scientist that he was, almost certainly knew what Hewson was doing; indeed he probably visited Hewson’s laboratory to see the work in progress. Our Family here is in great Distress. Poor Mrs. Hewson has lost her Husband, and Mrs. Stevenson her Son-in-law. He died last Sunday Morning of a Fever which baffled the Skill of our best Physicians. He was an excellent young Man, ingenious, industrious, useful, and belov’d by all that knew him. She is left with two young Children, and a third soon expected. He was just established in a profitable growing Business, with the best Prospects of bringing up his young Family advantageously. For more on the bone pit and for the Franklin quote see HERE and HERE. Please share your thoughts with us; leave a comment below.